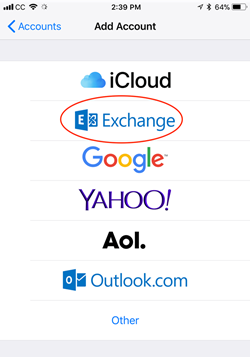 We recommend that you use Microsoft's Outlook App for iOS rather than iOS's native app. See Microsoft's Outlook App for iOS Mobile support page for download and setup instructions. 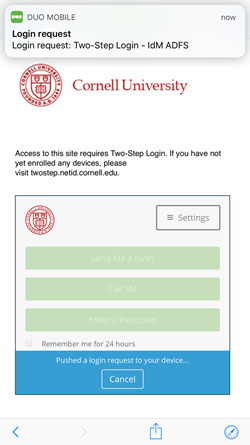 In addition to the steps listed there, you will also see Cornell's NetID login screen. If you follow this recommendation, you do NOT need the rest of the information presented here. If you choose to use iOS's native mail app, follow the steps below to configure your device for the Cornell environment. We strongly recommend that, when it comes to your calendar, you only use your mobile device for viewing, not accepting or declining meetings. Use Outlook on your computer or Outlook on the web to accept or decline meetings. 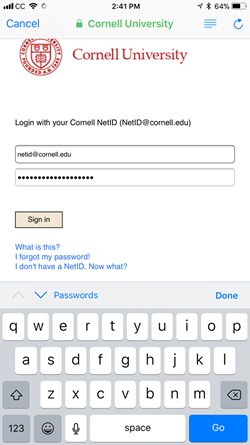 If you have never connected to your Cornell account on this device, skip to the next section, Add a Cornell.edu Exchange Account. 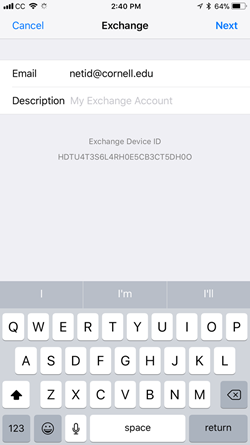 Check for both an Exchange Profile and an Exchange Account as shown here, deleting whichever you find. You will probably find only one of them. That's okay. Select your Cornell University Exchange Profile. If you are prompted to delete all your contacts, select No. Delete your Cornell University Exchange Account. 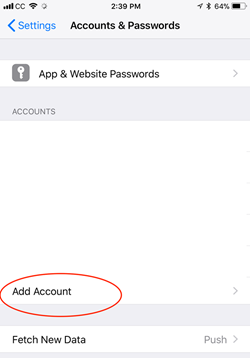 Under Settings, select Accounts and Passwords. 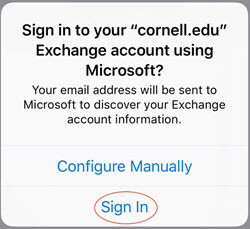 Under Sign in to your "cornell.edu" Exchange account using Microsoft, select Sign In. Enter your NetID and password, and select Sign In. If you have already opted in to Two-Step Login for Office 365, it will prompt you to authenticate. Select Accept, to allow iOS Accounts to Access your Mailboxes, Sign You In, and read your profile. If your Cornell email account is the only email account on your device, you are done. If you have more than one account and you don't want your Cornell account to be the default account, you are done. If you have more than one email account on your phone AND you want your Cornell account set as the default account, complete the steps below. 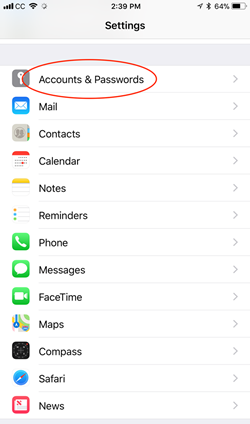 From the Home Screen tap Settings, then tap Mail, Contacts, Calendars. Scroll down to the Mail section and tap Default Account. Tap Cornell University to place a check next to it, indicating that it is now the default account. Scroll down to the Contacts section and tap Default Account. Scroll down to the Calendars section and tap Default Account. Under Cornell University you will see the a list of the calendars you have created in your Exchange account. Tap the calendar you would like to use as the default.